Croisier, vice-skip Jamie Smith, second Piper Croisier, lead Lauren Rajala and coach Shawn Croisier of the Idylwylde Golf & Country Club in Sudbury, Ont., defeated Ontario’s Emily Deschenes (Manotick Curling Club) 6-2 on Sunday afternoon at the Glen Allan Recreation Complex in Sherwood Park, Alta. It’s the second national gold medal the team will add to its trophy case this season. 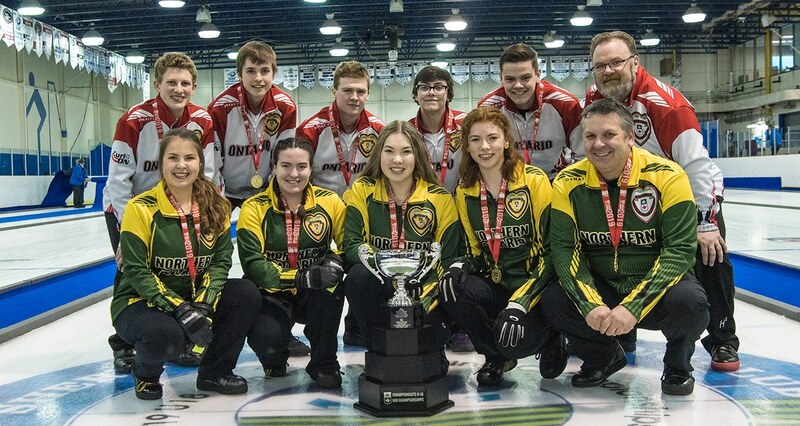 Team Croisier won gold at the Canada Winter Games in Red Deer, Alta., in February 2019. “What a way to end the season. We played really good all week and I’m pumped,” Croisier said. Croisier and her team took control of the game in the second half. Northern Ontario had a 2-1 lead at the fourth-end break and produced steals of two in both the fifth and sixth ends to take control of the game. “I’m so happy. Couldn’t believe we actually pulled it out. I don’t have any words,” she said, noting her team stayed positive throughout the week which helped lead to their success. On the men’s side, Ontario’s Dylan Niepage of the Coldwater & District Curling Club and his team won their first national Under-18 title. Ontario defeated British Columbia’s Erik Colwell (Vernon/Kamloops/Invermere Curling Clubs) in a closely-contested 6-5 game. With the game tied 2-2, Ontario capitalized on a steal of two in the third and a steal of one in the fourth for a 5-2 lead. “It’s so surreal. The fact that we came into this even hoping to make the championship round and now to be wearing this gold medal is just so surreal,” Niepage said following the game. Ontario started the week with one win and two losses before putting together seven straight wins to claim the gold medal. “We’ve been so resilient. Even though we were down in the beginning of the week we fought back every single game,” he said. One of Ontario’s initial losses came at the hand’s of Colwell. That 4-3 loss in the first game of the week was in the back of Niepage’s mind going into the final, but he believes his team improved a lot over the week. 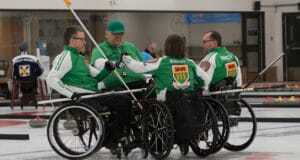 Bronze-medal winners were also determined on Sunday afternoon. 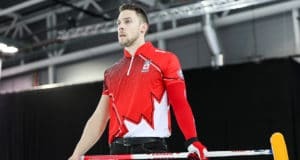 Manitoba’s Jordon McDonald (St. Vital Curling Club, Winnipeg) defeated Nova Scotia’s Adam McEachren (Truro Curling Club) 4-2 to win bronze. His team consists of vice-skip Jaedon Neuert, second Braxton Kuntz, lead Alexandre Fontaine and coach John Neuert. British Columbia’s Kaila Buchy (Kimberley Curling Club) picked up a solid bronze-medal win on the girl’s side against New Brunswick’s Melodie Forsythe (Curl Moncton) 8-1. Buchy’s team is rounded out by vice-skip Katelyn McGillivray, second Hannah Lindner, lead Arissa Toffolo and coach Tom Buchy. A mixed doubles tournament for non-playoff teams also concluded Sunday. Cate Fitzgerald (Nova Scotia)/Mitchell Schut (Prince Edward Island) and coach Brian Kelln (Northwest Territories) defeated Taylour Stevens (Nova Scotia)/Liam Kelly (Prince Edward Island) and coach Les Sonnenberg (Alberta Host Team) 8-6 in the gold-medal game. Chasity Atigikyoak (Northwest Territories) and Zachary Pedneault (Quebec) won bronze earlier in the day by defeating Katie Follett (Newfoundland & Labrador) and Sean Breadmore (Northern Ontario).